NZ prime minister Bill English declared recently in a press conference that his country would be funding US$10 million in a submarine cable between Tonga and Polynesia. The goal is to help to connect Aitutaki and Rarotonga, the main touristic islands, to the rest of the world, with enhanced speed and at lower prices. He mentioned another funding agreement signed with the Cook Islands, committing a little more than US$6 millions for the construction of a wastewater system. The goal is also to help the Cook Island enforce their infrastructure and be better prepared to support the growing number of tourists, which exceeds, nowadays, 140 000 annually. He stated : “So these announcements demonstrate our long term commitment to the stability and prosperity of the Cook Islands and its further economic development,”. Another step forward in the reduction of “oceanic borders” between Pacific lands. It seems like the spirit of adventure and cooperation leading our ancestors, who came from various places and times, is still around today. We are still pushing the limits, adapting skillfully to our context. Today, the main issue is the climate change. Tightening the links between us is crucial in these times of planetary crisis. One month before, the first international conference on floating Islands was held in the little island of Tahiti, in French Polynesia. It gathered politics, experts, businessmen and scientists from all around the world, most of which came from around the Pacific. Floating islands are a nice dream, and even though we might not see them floating around our islands anywhere soon, this event is full of meaning in itself. Think about it ! Specialists from Hawaii, Australia, USA, French Polynesia, France… gathered around one goal. One with major significations. First, adapting to climate change and the rise of sea level, a very serious threat for people living surrounded or coasted by the ocean, isn’t it ? 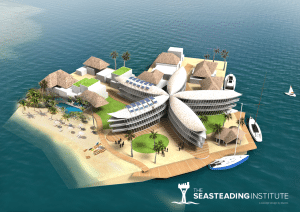 Second, adapting to seasteading. Again, it seems radically logical when living in such a maritime environment. Third, reducing the distance between lands. Fourth, boosting research and encouraging the rise of new technologies in the Pacific. Fifth, experiencing, perhaps, new human societies, freed from mainstream political paradigms. The main aspect of this event was, nevertheless, the cooperation between scattered “Pacific” nations. United, we can make a difference. At least, it will better than struggling, alone, to face the many challenges that the future holds. The meeting concluded on this sentence, which was pronounced by Pascal Erhel Hatuuku, of Marquesan ascendency. He backed-up is sayings by recalling how much modern concepts, and sometimes words, originated from these regions, and from the solutions found centuries ago by these seafarers to adapt to oceanic environment : catamaran, multihulls, permaculture, hydroponics, cuttings, layering, desiccation, bio-climatic habitat, biomimicry. All these originated from indigenous Oceanic traditions. Our ancestors did face great challenges in the past, and succeeded in overcoming them. Conditions have changed today. The threats are different. The context is different. However, we still have the same “mana” flowing in our veins. We shall succeed, and the more easier if we work together.